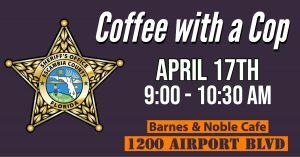 Join us for Coffee with a Cop on April 17th from 9 – 10:30 AM at the Barnes & Noble Cafe! Barnes and Noble is located at 1200 Airport Boulevard; Pensacola. Coffee with a Cop provides a unique opportunity for community members to ask questions and learn more about the Sheriff’s Office’s work in Escambia County. Coffee with a Cop events are great opportunities for Escambia County Deputies and community members to come together in an informal, neutral space to discuss community issues, build relationships, and drink coffee. All community members are invited to attend Coffee with a Cop. Questions? Would you like to hold a Milkshake or Coffee with a Cop at your place of business or worship? Email us at coffeewithacop@escambiaso.com.